Ever wished you could order your lunch at the touch of a button? Now Disneyland Resort guests can do just that and more, thanks to the new mobile ordering service now available on the Disneyland App! 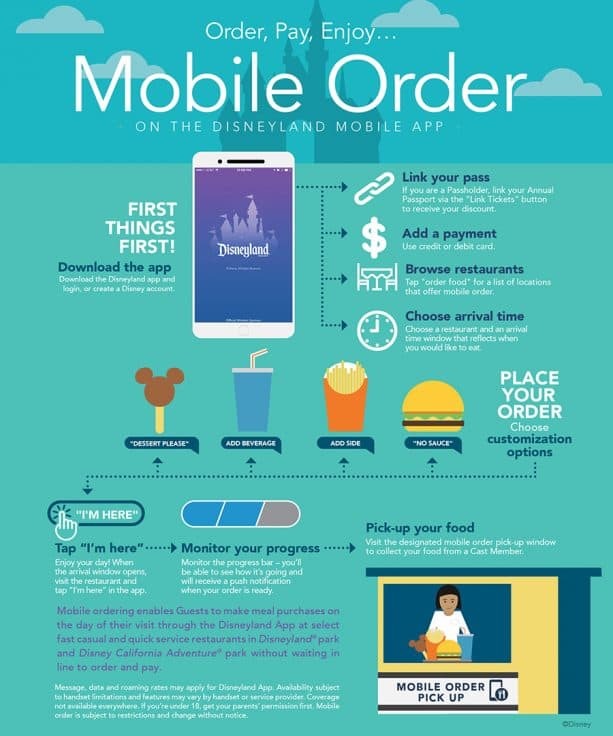 To order from any of the 15 fast casual and quick-service restaurant locations, simply download the Disneyland App (or install the latest app update) and follow the prompts to register for an account. From there, you can search for a participating location, select an arrival time window for pickup, choose items from the menu and place an order. For more information, check out our video tutorial and take a look the infographic below. Happy ordering! 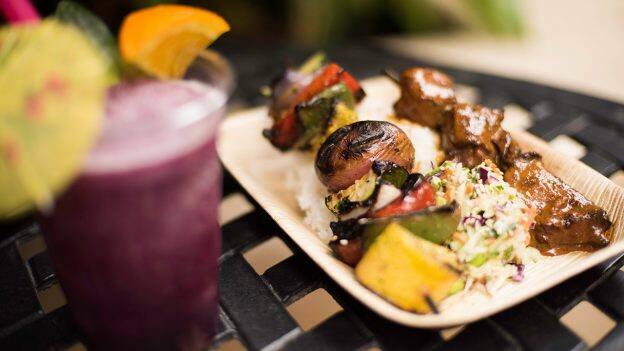 Mobile ordering service is now available at six Disneyland park locations – Bengal Barbecue, Galactic Grill, Gibson Girl Ice Cream Parlor, Hungry Bear Restaurant, Jolly Holiday Bakery Café and Red Rose Taverne – and nine Disney California Adventure park locations – Award Wieners, Clarabelle’s Hand-Scooped Ice Cream, Cocina Cucamonga Mexican Grill, Corn Dog Castle, Flo’s V8 Café, Lucky Fortune Cookery, Pacific Wharf Café, Paradise Garden Grill and Smokejumpers Grill. If you place an order, can you cancel the order before you tap “I’m here”? For instance, you place an order but cannot make the arrival window or other issues arise and cannot go at all, can you cancel & be refunded for the placed order? I want to pay with a gift card, too. Otherwise, I love it! Yes! Add gift card payment functionality please! This is amazing! I can’t wait to use it when we go in October. Anything to save time! 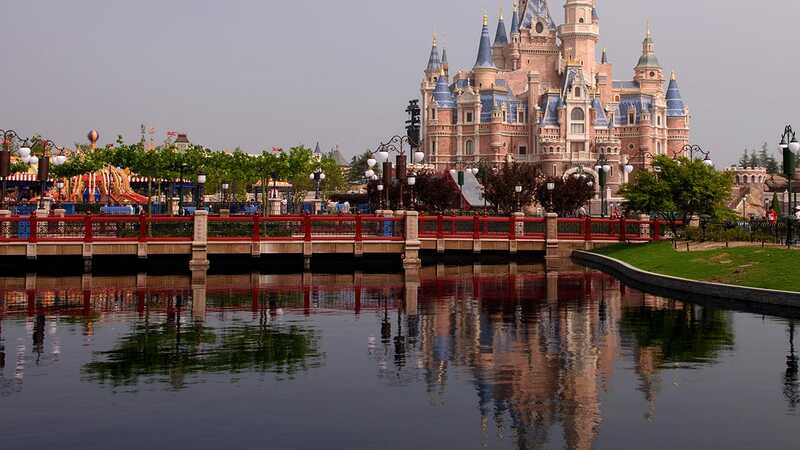 Can you charge it to your disney hotels room? Can you make allergy requests for your order? Love the app. Gift cards for payment would be awesome. Also, we need more “customized options”. Since Disney refuses to add vegan options, we have to play around with menus to make a meal. We are in CA, vegan menus aren’t something new or taboo. Please take care of all your guests. Thanks! is there a way to save payment method on the app? Will the option to pay with gift cards be added soon? Are there any plans to expand to Stagedoor Cafe? Would love this app and option a lot more if it were available on Android. The entire world is not in love with Apple! Come on Disneyland, you need to catch up to your Florida brother! Hi Deborah – the Disneyland App is available for both iPhone and Android users! I used the feature this past weekend and Flo’s and saved so much time. I have used this before at WDW and loved it when we were there as well. Will more QS be added in the future?